DO YOU OWN A MINI PIANO? The pianos illustrated above are from the 1930s period; the one on the left is a standard mini piano, and the one on the right is a more deluxe model boasting the Art Deco period, showing chrome banding, chrome hinges/ lid stay, and the unique fluted chrome electric candle bulb scones. A question you need to ask yourself is "do I buy something that looks attractive"? .... or "do I buy something that sounds good"? Well, in terms of beauty, these piano tick all the boxes, and can easily be located in an alcove in your living room. Close the lid, put a cloth over it, and it just looks like a chest cabinet. I once went to tune one (1940s style), and when I entered the living room, I asked, "Where is the piano?" .... oh yes, it was neatly tucked away in the corner with a lace table cloth covering it, and a nice bunch of flowers - bless! So.... what if you need a piano that sounds like a proper piano? .... well, they do sound like a piano to a certain degree, but with strings ageing around 90 years, some sound a bit "plinky plonky". 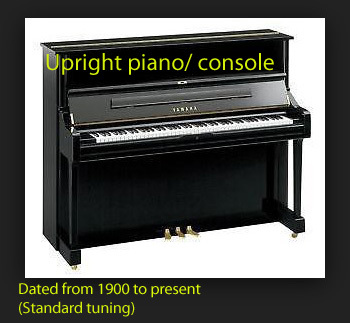 The strings are much shorter than a standard upright piano, and instead of the treble having 3 strings per note (tri-chord), these only have 2. Some notes in the middle only have 1 string. The overall sound with the sustain pedal is OK, but generally, they have a "thinner" and weaker sound than most standard pianos. Of course, we also want a piano that not only sounds nice, but stays in tune.... well, in most cases, you may be disappointed here. Due to the structural design of these pianos, their size, and having the wrest plank fully exposed in the middle of the piano, only expect the same level of stability as a garden shed knocked up with a few nails and screws. The next thing you need to consider is its location. 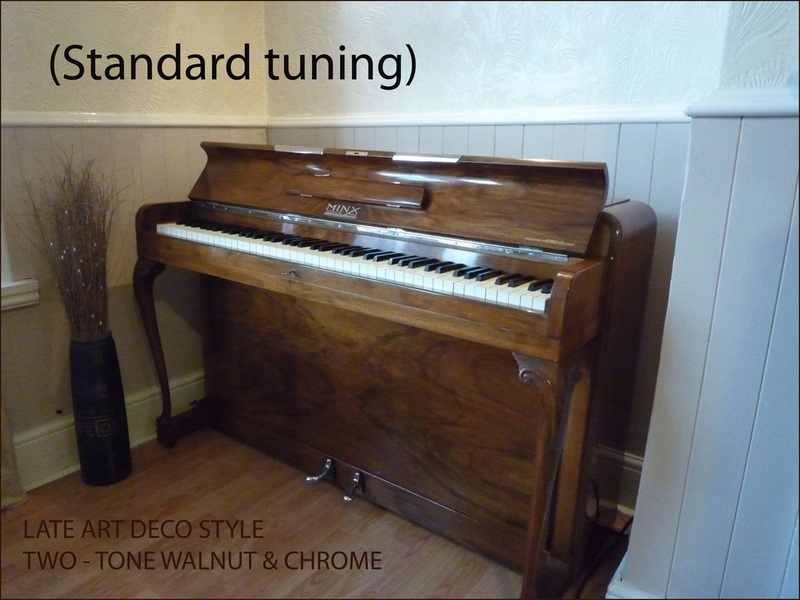 If you buy the 1930s style (as above), each time it is tuned, it must be yanked away from the wall - leaving loads of space behind. Many piano tuners now simply walk away at the prospects of having to encounter a gym session by trying to drag your piano along your lovely new flooring, and having no castors on the piano makes it very difficult. I arrived at a house once in Northumberland, and their mini piano was located on the upstairs landing, just a few inches away from the top step! .... so I sincerely apologised that the piano would not be tuned today; I didn't charge them a call-out, and quietly walked away. This is similar to owning an old VW Beetle. Reversed into the garage, the back bumper/ boot is almost touching the garage wall (where the engine is), and then asking your local mechanic to service the engine. Obviously you would move the car forward (if it had all 4 wheels on) - easy.... but not so easy for a 1/4 ton of mini piano to be dragged along your carpet or lovely laminated flooring and the piano having no castors. This page will hopefully enlighten you into the realms of owning a mini piano, what to expect, and mentioning various pitfalls, anecdotes, and often is the case "headache" incidents. If you are lucky to find one that can still be tuned, then expect a double-sized bill/ twice the cost of a standard upright piano tuning. The notes here do not provide a historic report about any mini piano, nor do they reflect their age in conjunction with serial numbers.... this report is purely to outline some features regarding tuning & repairs only. 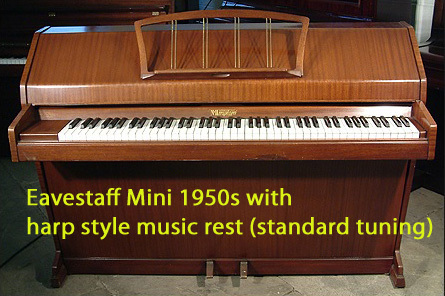 Some pianos may be labelled as being (say) "1950s" .... or "1940s" - however, they may have been manufactured much later or earlier, and nor do these notes reflect in any way about specific models of Eavestaff and their dates. This information is a guide only, and is not meant to contain historic information regarding exact dates & periods/ models of piano and periods. This is a guide only. Do you own, been given one free, or are thinking of buying a mini piano like this ? Looks beautiful with double chrome banding...... very luring indeed.... or is it? 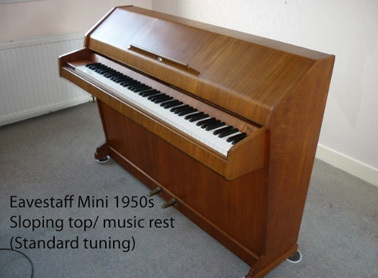 Eavestaff Mini Piano (1930s) - showing hidden tuning pins under the keyboard. By releasing a trap door, this drops down to reveal the (often) troublesome tuning pins. direction to a standard upright piano. Tuning pins are tapered, and can be tapped in further for more torque. Pin can also be replaced with oversized pin. Double-ended tuning pins are not tapered, and cannot be tapped in either direction for better torque because the threads are in the middle. Injection solution is the only answer to swell the wrest plank, and fill any internal cracks. No new pins in stock. Why do these mini pianos cost more to tune? An average standard piano tuning costs in the region of £45, and takes about an hour. An Eavestaff 30s piano tuning costs in the region of £90, and takes about 2.5 hours. The reason for this is because the piano has to be partly dismantled first prior to tuning; then the tuning itself is a task because all the strings are back to front; then the piano requires to be assembled again. 1. Pull out piano well away from a wall or alcove. Eavestaff 1930s: All strings run in opposite direction, so bass strings are on the right, moving left to treble. This example shows the muting strip starting on Middle C (for clarity). 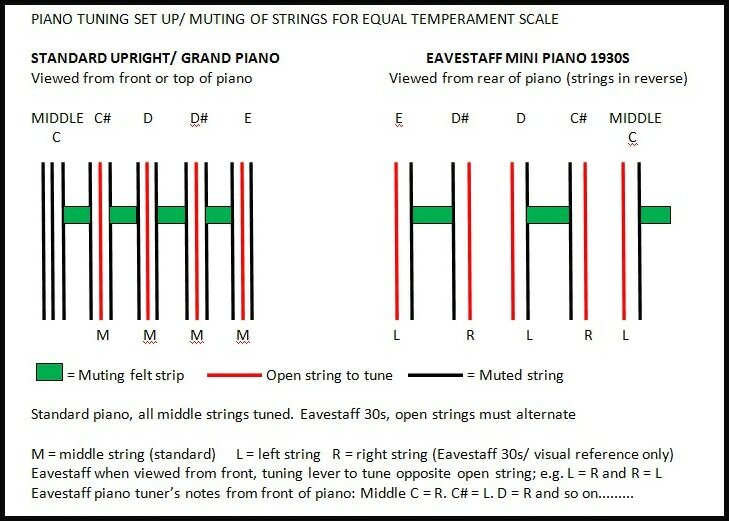 As the muting strip mutes the strings in a left/ right alternating formation, when the piano tuner resumes the tuning lever position at the front of the piano, the strings are now opposite to each other - so reference must be made on a piece of paper prior to tuning, otherwise the wrong (muted) strings may be pulled on instead. This process is repeated many times to set the Equal Temperament scaling required for tuning the rest of the piano. 6. Tuning remaining strings in octave intervals - leaning backwards and forwards over piano about 150 times. 7. Remove muting strip / tune "muted" string to other.... remembering the notes, tuning opposite R/L strings. 8. Assembly of piano and relocate. Do you own or are you thinking of buying one of these pianos? Have you had it tuned yet? Did you know these mini pianos cost about twice as much to tune than a standard piano? CHECK THE BOTTOM/ LOWER PANEL? 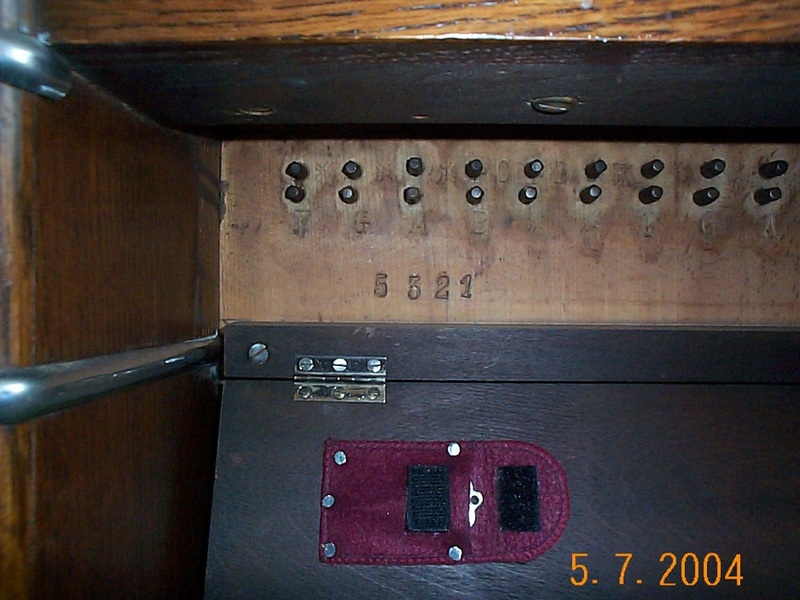 Like above, if the bottom panel cannot be removed, and is a solid panel fixed to the cabinet, then the piano can only be tuned from the back (compare the above to the footer "1940s Eavestaff"). If you own one of these, it must be pulled out from the wall leaving about 6 - 8 foot clearance, to gain access behind. Your piano tuner is not responsible for moving your piano, so it is best to arrange to move it prior to a tuning appointment. In most cases these pianos do not have castors and could damage laminated flooring if moved incorrectly. If your piano looks similar to these 2 above, but the bottom panel can be removed easily (usually held in position with a wooden spring slat), then your piano (even though a mini) - is a standard tuning procedure, and nothing to worry about. 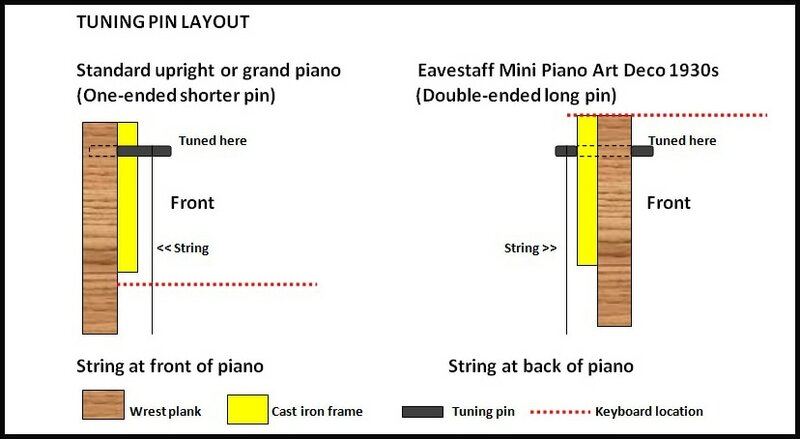 The Eavestaff Mini piano - (1930s style above) have special "double ended" tuning pins driven into the wrest plank, and are now common to have problems tuning when they become loose. The pins are much longer than a normal tuning pin because at the front end (under the keyboard) is where they are tuned.... the pin is driven all the way through the wrest plank so the other end sticks out the back (like a game of ker - plunk), to allow the string to be wound around it (in reverse). If a tuning pin becomes loose, and it is an isolated "one-off" case, then the pin can be removed, wrest pin hole plugged, re-drilled, and the existing pin driven back in (making a separate appointment) - but it is a risk. If however, there is a series of loose pins - alternating in-line (loose, tight, loose tight etc), this could be a crack in the wrest plank itself, then regrettably extensive repairs must be made (see "Injection Moulding System" below). These special tuning pins are no longer available. Temporary repairs can be done which involve using an injection process to swell the wrest plank and tighten the pins, however any kind of repair or refurbishment done to these types of pianos are always risky, and do not have any warranty. We also do not accept any kind of come-back or blame if we do work.... it is simply a 50/ 50 chance, and a risk you may wish to take. If you are in the process of having this style of piano moved to your home, and awaiting a piano tuning, please ask the removal team to leave your piano well away from a wall or alcove. After a tuning, I can move it into its final position. If in doubt, please send a photo of your piano. 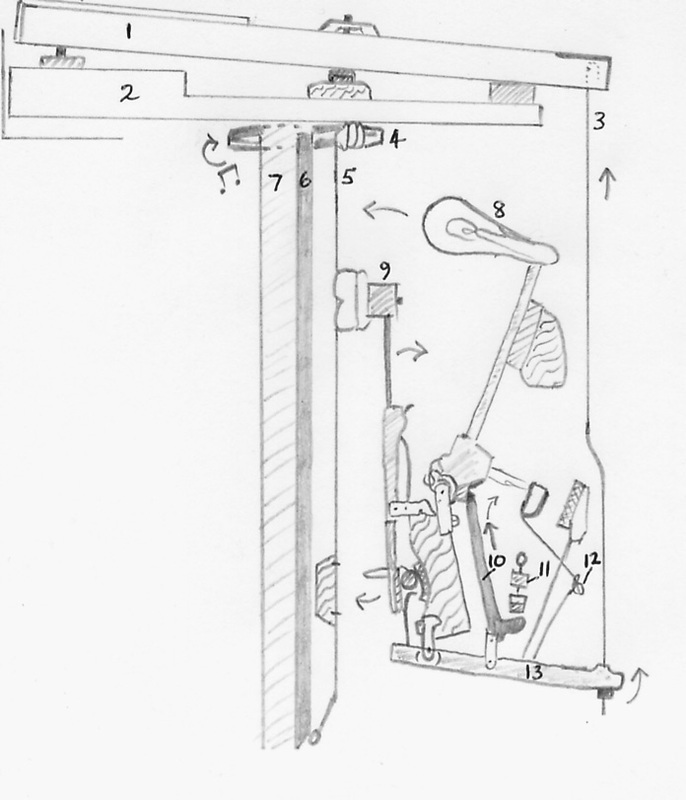 See removal diagram below for locating your piano ready for a tuning. Before you consider buying a mini piano, similar to the one above, it is strongly recommended to have the piano checked over and various tuning tests carried out prior to purchase. Some of these pianos are fine, but many 1930s models like this one are now nearly 90 years old, and due to their tuning pin position and design, they often have tuning difficulties. Previous markings on the tuning pins like white chalk suggest the tuner has come across a loose tuning pin, and that string cannot be tuned. The Eavestaff Mini Royale piano (as above) of the 1930s is not to be confused with other mini pianos of a similar look or style. Some piano tuners will presume that you own a standard upright piano - some tuners will ask you for more details. If the tuner does not ask, always tell the tuner it is a mini piano. If the mechanism is at the back, you will need to ask a friend or relative to help you to pull out the piano. These pianos must be pulled out if against a wall, or in an alcove to be tuned. Also, if the piano is near a staircase top step (i.e. situated on a landing), it may need to be permanently moved somewhere else - this is the responsibility of the owner to move the piano, not the piano tuner. How is an 1930s style Eavestaff Mini tuned (mechanism at the back)? Arrow showing the direction of the reclining procedure. Below the tail of the arrow, a strip of green felt is weaved between various strings in preparation of tuning the middle octave; the keyboard and action is then replaced back into its normal position ready for tuning. As well as working from the back of the piano - using wedges to mute strings, the piano is simultaneously tuned with a lever from under the keyboard, where the tuning pins are located - this is a "backward and forward" process for every note. As seen above, from the rear of the piano, all the strings are the opposite way round to a standard piano, so the bass strings are on the right (in reverse to the front). To tune the strings, the piano tuner needs to make various notes on paper which are strings are muted, and which strings are open, so when working from the front, we can remember the sequence. 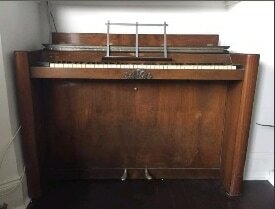 If your 1930s Eavestaff mini piano is a family heirloom, passed down to you from a generation - and you find out it cannot be tuned, then don't worry, help is on it's way. AA Piano Tuners UK specialise in bringing this type of piano back to life using a special injection moulding system to tighten the tuning pins. We have carried out this repair on many mini pianos like this, and we are very successful. If this is the case, your piano would need to be shipped to our workshop here in Yorkshire, then undergo this treatment. We would also need to refurbish parts of the mechanism during the injection process to ensure that everything went back in place correctly and safely. These pianos are very heavy and most are not fitted with castors. Although these pianos are similar in shape, they are a standard upright piano/ don't need pulling out / standard tuning procedures. Mini pianos have various different music rests - even two of the same models and year have different rests (image 1 + 3). This aspect is not important. If your piano is any kind of mini piano (regardless of its name or shape), always tell your piano tuner first. 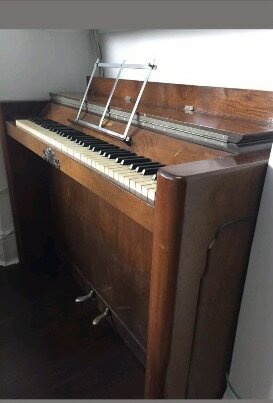 This style of piano is very similar to the 1930s model, but with one big difference, the piano can be tuned from the front only, and the action mechanism, cast frame, soundboard & strings and tuning pins are all located at the front, making tuning/ access easier (and cheaper).... however, as the bottom panel is removed, this reveals the dreaded "drop action" - very similar to the 1930s style, but now at the front. The tuning pin location can be an issue, as they are in-line with the back of the piano keys, so a special / shorter tuning lever is required. 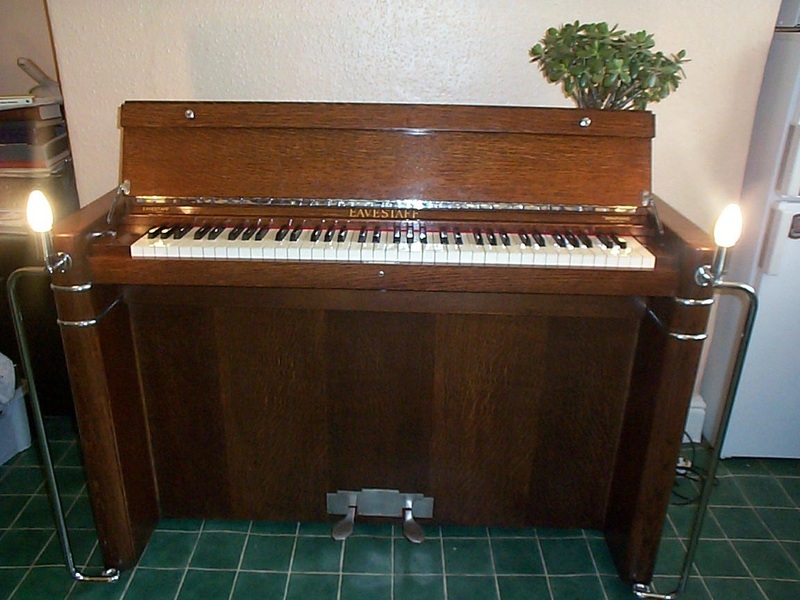 Just like the Eavestaff's sister of the 1930s, this 1940s "drop action" works from UNDER the piano, and a series of lift wires connected to the back of the piano keys assist in playing the notes. Tuning one of these requires a special tuning lever (that some piano tuners may not have), so it is best to warn your tuner in advance before a wasted call-out. DROP ACTION REPAIRS / NOTES NOT WORKING ? This is the crux of the matter. If all the notes are working, then great - play on - can be tuned like a normal upright piano. However, if any note stops working/ broken parts / broken string etc., then these pianos cannot be repaired quickly and easily in your home. A drop action takes several hours to remove, which includes removal of the piano keys, and often the key frame to allow sufficient eyes in the back of your head to watch those lift wires, and prevent any damage. 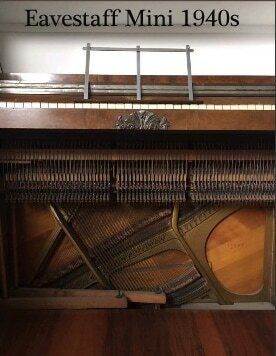 For this reason, many pianos like this are refused to be tuned/ worked on/ repaired, and (if the tuner is inclined and needs the work), the WHOLE piano must be moved to a workshop environment to enable the mechanism to be removed safely, even if just for one repair. This kind of work is similar to a £5 crank shaft oil seal costing over £1K in labour to remove the engine.